A few weeks back, I purchased a cute fabric scrapbook designed by Donna Downey. I liked the idea of having some regular page protectors mixed with fabric pages. But, what theme to feature in this scrapbook? I had been thinking about making a scrapbook page that had small samples of a number of the crafts that I have been involved with through the years. So, I have decided to make this book an "Ode to Crafts" or a personal history of all of the crafts I have loved before and now that I am into Paper Crafts. To me that is the fun part about paper crafting...you can also incorporate other crafts and techniques into cards and scrapbook pages. This also got me to thinking about why I craft. I had an interesting conversation with two of my crafting buddies this weekend. We were all lamenting about how much "stuff" each of us has, how overwhelming it us to have it all, how we hate to pack up and travel sometimes even though it is fun to get together. One friend was lamenting that she had only been creating cards for a few years, and didn't want to continue spending time alone in her craft room making things. But, I realized that I don't see it that way. First, I have always been creating things, from when I was a young girl. See below for a list of crafts that I have been involved with at some point in my lifetime. I create because I enjoy the process. It relaxes me, and I enjoy the tactile aspect of handling everything and putting a project together. Second, I enjoy the results of giving someone a handmade gift. Even with something like a digital scrapbook, involves blessing them with something that you thought about ahead of time and made just for them. Plus I often craft with other people, so there is a social aspect to it also. When I don't create, I get bored and cranky, which is not a good combo! So, here is a list of the crafts I have worked on in my lifetime (this is complete subject to remembering some other details). I'm going to make all of the pages 8x8, and I'm going to have 2 3x3 squares that demonstrate the craft I'm focusing on for that page. See the first page below. So, why do you create? 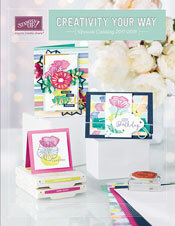 What other crafts are you involved in beside paper crafting and/or scrapbooking? I'm sure there are some more!